On this day we set aside to remember ways to be kind to the planet (and ideally it’s something we incorporate into our lives year round), I thought I’d talk about basil (ocimum basilicum) before these posts started sounding like a bad Crosby, Stills, Nash, & Young song. I’ve heard that there are something like 22 different types of basil–and if you give the growers a few minutes there will surely be more. Each year I grow at least 2 or 3 because, unlike the thymes, I can distinguish distinct flavors even between the “green-leafed” types. 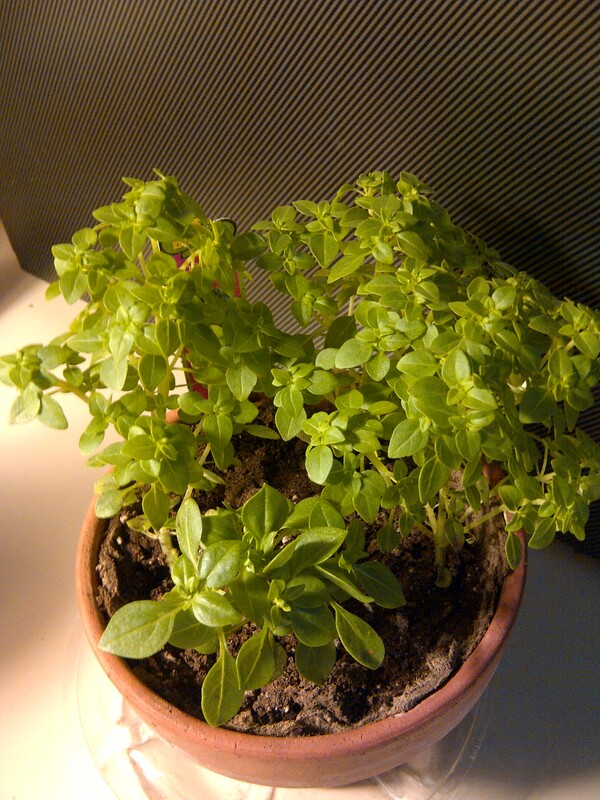 First a bit about growing, because basil can be tricky. If you’re starting seed, be scrupulous about the seed conditions–cleanliness, moistness, etc., because basil gets a host of fungal diseases. Even once you have the plants–whether you buy them or grow them–be careful not to put them outside when the temperatures are too cool or to overwater them–again, because the fungal diseases. I know you all know what I’m talking about; you may just not have known what was happening. Fusarium wilt is caused by a soil borne fungus. You’ll notice that all of a sudden the growing tip of the plant is wilted over and gray. There is no cure for this–most extension services recommend you destroy the plant. Since I’m growing in pots, I just isolate the pot and prune out the affected parts of the plant. I can usually stop the wilt if the weather cooperates. Gray mold causes the plant to lose leaves. This is caused by harvesting in wet weather or watering overhead (or wet weather on not fully healed harvesting cuts). I haven’t figured out how to keep the rain from “watering overhead” yet (nor do I want to!). I’ll settle for some loss of leaves on the basil now and again. Once again, I just isolate the plants and hope for sun. In really wet years, I’ve lost all the plants. Now as to basil types. With this one, since, even to me there are distinct differences in taste, your choices are limited only by your palate. And here, don’t think of basil simply for salads, sauces, pizza and cooking. The chefs have gotten really good at getting us to think a bit out of the box when using herbs. Try a lemony basil–or even a plain one–with some watermelon–or peaches. Don’t scoff until you’ve tried it. Try a little basil on some ice cream. It’s delicious. And it’s fabulous in lemonade or iced tea instead of mint (basil is a mint-family plant–you know that because its stem is square). There are purple basils and variegated ones–they even make a lovely, impromptu bouquet for the picnic table. Best of all, folks can garnish their meals right from the vase!